The MARISA Seasonal Climate Impacts Summary and Outlook is a quarterly series produced by the Mid-Atlantic Regional Integrated Sciences and Assessments (MARISA) program, a collaboration funded by NOAA through RAND and researchers at Pennsylvania State University, Johns Hopkins University, and Cornell University. This series draws information from regional climate centers, news and weather information, and regional-specific climate datasets for the benefit of policymakers, practitioners, residents, and community leaders in the Chesapeake Bay Watershed. Projections of weather and climate variability and change in the Chesapeake Bay Watershed come from the best available scientific information. 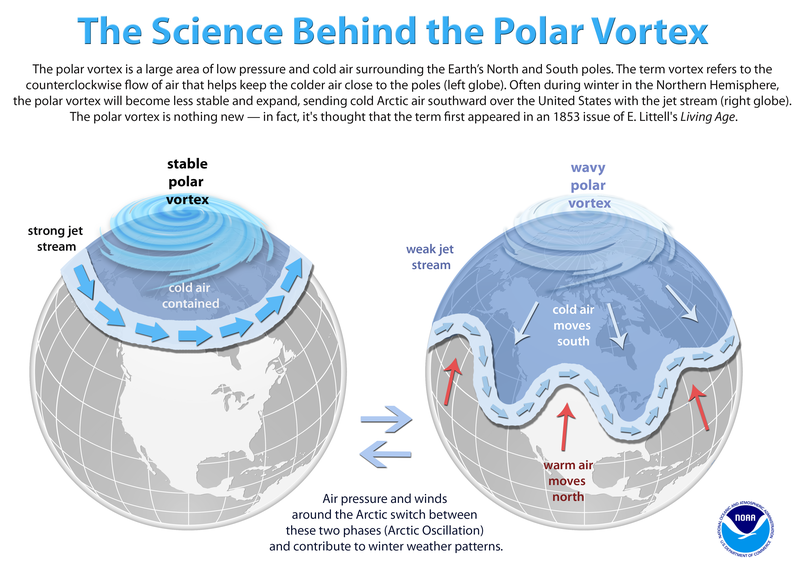 Part 1 details significant weather events that occurred in the Winter 2018-2019 season. Part 2 characterizes seasonal temperature and precipitation compared to historical averages. Part 3 describes seasonal weather forecasts and pertinent information for the upcoming Spring 2019 season. Part 4 includes an analysis of multi-decadal changes in seasonal precipitation, accompanied by interactive maps of climate projections. From December 2018 through the end of February 2019, extreme weather events caused disruptions, delays, and damages within the Chesapeake Bay Watershed. A December snowstorm dropped up to 15.2 inches of snow on western and central Virginia from December 9th-10th. Richmond, VA, had its greatest daily snowfall for December 9th on record, with 11.5 inches over the storm duration recorded at the Richmond airport.1 The National Weather Service reported that for all stations monitored by the Blacksburg, Virginia weather forecast office, this was the earliest large December snowfall on record2. The storm caused travel delays and power outages. Note: Normal average temperature is based on temperature data from 1981-2010. Red indicates above normal temperature. Source: Northeast Regional Climate Center, 2019. Between December 1, 2018 through February 28, 2019, precipitation departures from normal historical precipitation for the period 1981 to 2010 show that most of the region experienced increases in precipitation compared to historical normal precipitation. 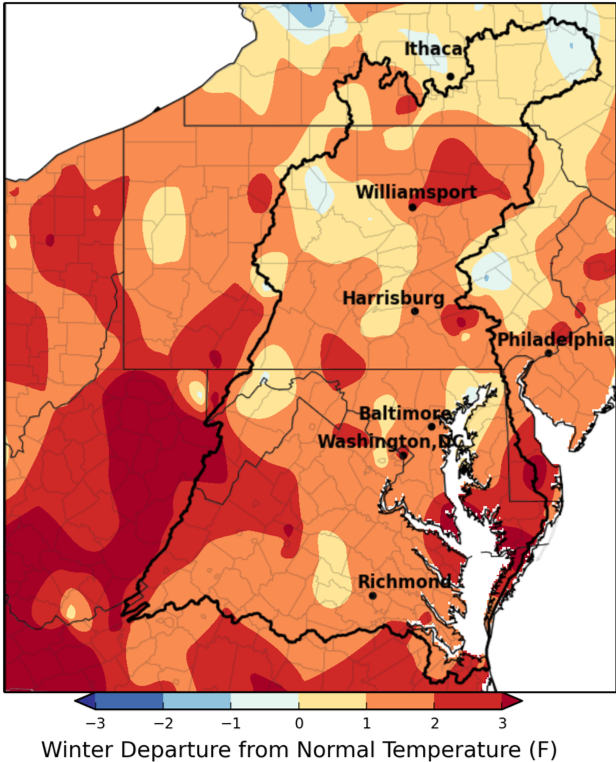 Western Virginia, southern and central Pennsylvania and western Maryland experienced the highest rates of precipitation departures—between 150 and 200 percent of normal. 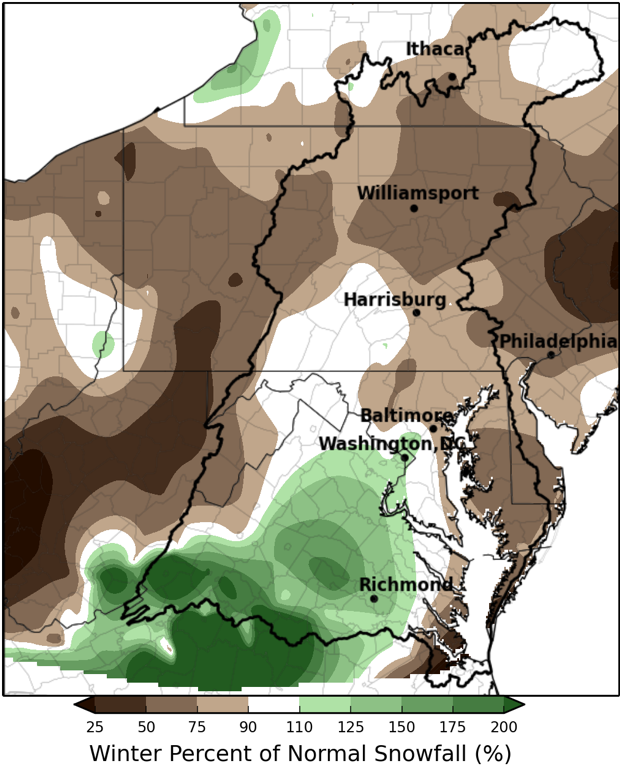 Areas vulnerable to flooding in the southern reaches of the Chesapeake Bay also saw precipitation nearly double, compared to historical averages during this period. Note: Normal seasonal precipitation is based on precipitation data from 1981-2010. 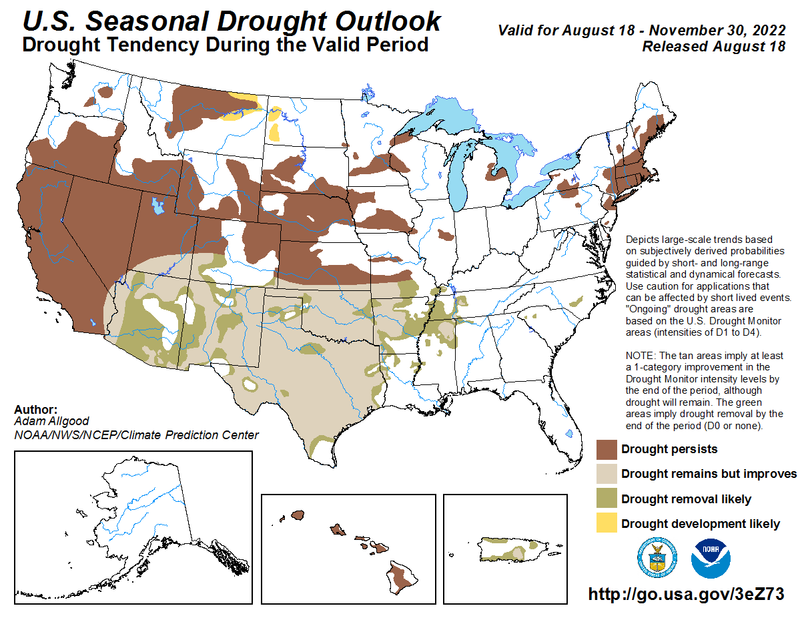 Brown indicates below normal seasonal precipitation. An analysis of how total winter snowfall between December 1, 2018 and February 28, 2019 compared to historical averages shows that the region experienced two different trends in snowfall. 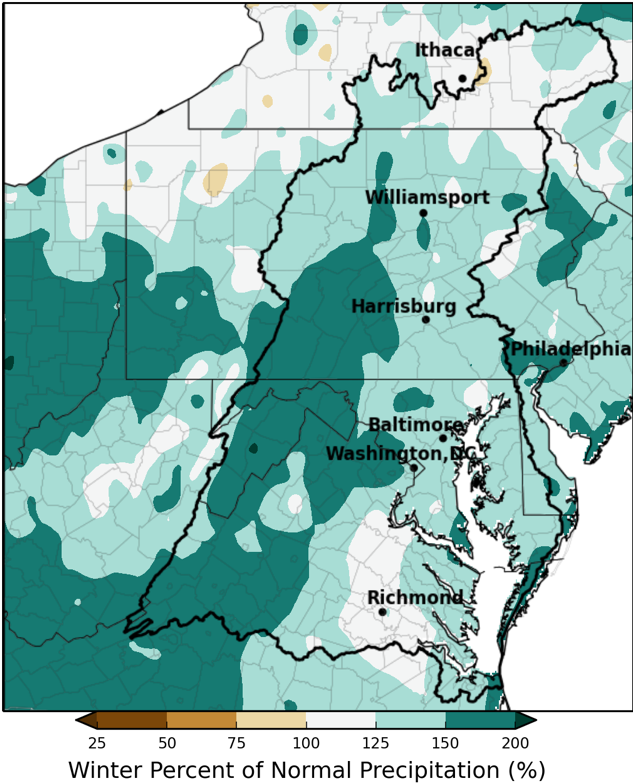 The majority of the northern two-thirds of the Chesapeake Bay watershed (northern Maryland and Pennsylvania) saw snowfall at 50-75 percent of normal, a decrease in total winter snowfall. Much of Virginia, however, experienced increases in snowfall compared to normal, with snowfall at 150-200 percent of normal or higher. The decrease in snowfall in the northern Chesapeake Bay watershed, combined with increases in total winter precipitation (see Figure 3), suggests that more precipitation is falling as rain, rather than snow, in northern Maryland and Central Pennsylvania. Note: Normal seasonal snowfall totals are based on snowfall records from 1981-2010. NOAA's Climate Prediction Center, which monitors the likelihood of occurrence of El Niño and La Niña climate phenomena, has issued a El Niño Advisory, meaning that weak El Niño conditions have formed and are likely to effect the Northern Hemisphere through Spring 2019.20 El Niño is a climate phenomenon characterized by a warming of the sea surface temperatures in the central and eastern tropical Pacific Ocean that leads to changes in weather across the globe. In the Mid-Atlantic, large storm events are more frequent during El Niño due to warmer ocean temperatures.21 While this generally results in wetter weather, weather impacts to the Chesapeake Bay Watershed can be difficult to predict. The following figures provide detail on how the total precipitation occurring each season has changed over time (Figure 5) and could change into the future (Figure 6). In some areas, such as the northern region of the Chesapeake Bay Watershed, total winter precipitation has increased between 2006-2017 compared to historical averages, while fall total precipitation has decreased. Further, our analysis of future projections of seasonal total precipitation suggests that increases in winter precipitation, compared to historical averages, could continue. Precipitation shifts in magnitude, intensity and timing will likely necessitate changes in management of stormwater systems, reservoirs, agriculture, and urban planning. In general, the region has experienced increases in summer seasonal precipitation from 2006-2017 compared to historical averages, with higher percentage increases in the eastern half of the Chesapeake Bay Watershed. Southeastern Chesapeake Bay has seen notable decreases in winter and spring total precipitation. By holding your mouse over an individual grid cell, a window that shows trends in the seasonal total precipitation will pop up. This data was calculated for each year of the analysis and for each grid cell. Using the dropdown menu, users should first select a geographic level—the entire watershed, state, county or municipality. A list of states, counties or municipalities will appear, and individual locations can then be selected. The ChesWx gridded climate datasets contain daily interpolations of precipitation and temperature observations for the Chesapeake Bay watershed, as well as the broader Mid-Atlantic and surrounding regions. Data are available from 1948 to 2017 at 4km spacial resolution. For this study, we utilized ChesWx daily precipitation data over the Chesapeake Bay watershed from 1976 to 2017. Access ChesWx data and learn more about the ChesWx methodology and input datasets. Seasonal total precipitation was determined for each season by summing all daily precipitation events that occurred for each three-month season. We calculated seasonal total precipitation for each season for each year and the averaged values for each season across 30-year periods – 1976-2005, 2006-2035, 2036-2065, 2066-2095 for LOCA data for both RCP 4.5 and RCP 8.5 and 1976-2005, 2006-2017 for ChesWx data. To average across climate models for each grid cell in the LOCA dataset, we employed a weighted average provided by the Northeast Regional Climate Center. Both LOCA and ChesWx datasets were masked to the boundaries of the Chesapeake Bay watershed before calculating seasonal precipitation values and the spatial resolution of each dataset was preserved. Winter is defined as December, January and February. Spring is defined as March, April and May. Summer is defined as June, July and August. Fall is defined as September, October and November. All future time periods and emissions scenarios show increases in seasonal total precipitation in the winter and spring across the Chesapeake Bay watershed. This is consistent with increases in precipitation seen in the Winter 2018-2019 season (see Figure 3). Winter precipitation could increase by as much as 30 percent in the northwestern region of the Chesapeake Bay Watershed by the end of the century. Combined with projected changes in spring precipitation, heightened winter precipitation could lead to more dramatic spring flooding as snow melts and spring precipitation increase simultaneously. By holding your mouse over an individual grid cell, a window that shows trends in the seasonal total precipitation will pop up. This data was calculated for each year of the analysis, for each grid cell and will change as you select different metrics, years and future emissions scenarios using the instructions above. LOCA or Localized Constructed Analogs is a downscaled climate data product available at 1/16thdegree (6 km) resolution over the continental United States. LOCA datasets include the 32 climate models available in the CMIP5 archive, for two future greenhouse gas concentration trajectories – RCP 4.5 and RCP8.5. For this study, we utilized LOCA data over the Chesapeake Bay watershed from 1976-2095. Access LOCA datasets and learn more about the methodology. This summary is the start of a series of climate summaries produced by MARISA for stakeholders, decisionmakers and water managers in the Chesapeake Bay watershed. For any questions or comments, please contact Krista Romita Grocholski at Krista_Romita_Grocholski@rand.org. By signing up to receive the climate summaries, you will be notified by email when new editions are published on the MARISA website.